Here's what the store bought ones look like. I ate my evidence before I could snap some pix. Gotta remember, photos first, then eat! Have you tried the Roasted Seaweed Snacks from Trader Joe's yet? Super tasty! And super easy to make your own. These are the things I come up with on a whim when the cupboards are bare. Yeah, I'm guessing not everyone has nori on hand, but if you cruise by your Asian market, or just that section at your grocery store, you can pick up some. Also grab some oil--olive, truffle, sesame--what ever floats your boat. 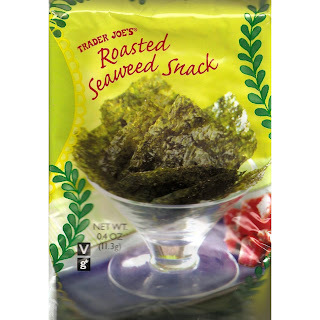 Make Your Own Roasted Seaweed Snacks. remove from the oven and voilà! yummy, crunchy seaweed snacks. You could cut the sheets up prior to roasting on place them on a baking sheet. We ate ours up promptly, but you can store them for a few days in an air tight container. But I doubt you will, since they are so tasty and have very few calories.